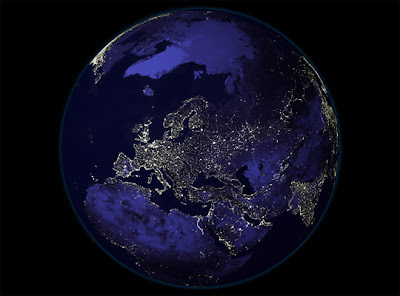 This is a composite image made by the National Aeronautics and Space Administration (NASA) of the Northern Hemisphere in Europe and part of Africa and Eurasia. At the top is the Arctic, which Russian scientists and members of parliament are currently exploring, going down in a submarine called Mir to the bottom of the Arctic Sea, 14,000 feet below the surface. The Russians have laid claim to much of the Arctic, asserting that a seabed ridge called the Lomonosov Ridge, which extends to Northern Canada, is really part of the Russian continent.